Sometimes the tiniest bit of calligraphy has a huge impact. Example below is a guest book – this makes such an impact on the page and is a nice memento for the bride and groom. I had the good fortune of being hired to work with a Mother of the Bride helping plan her daughter’s wedding in September. The invitations are beautiful William Arthur in blue ink with a spectacular silver swirl design. We decided to go with an italic script in a matching blue ink. They did turn out well if I say so myself. 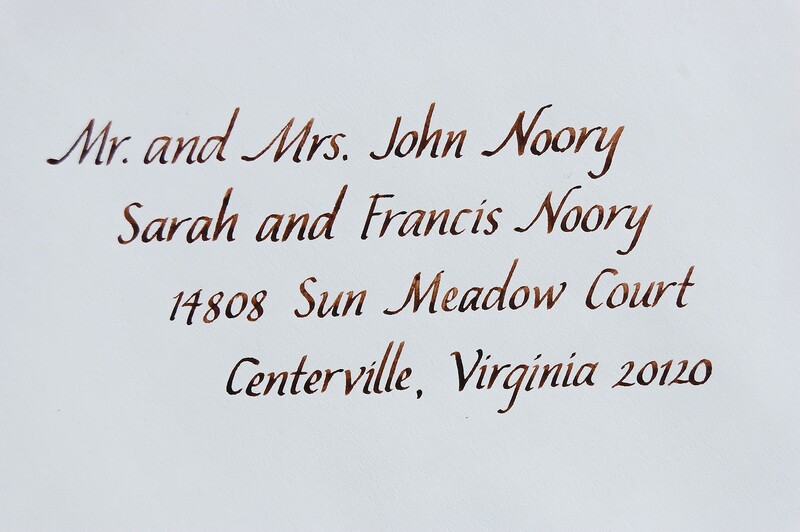 I had the good fortune of learning that I am a featured calligrapher on the EAD Library at Elizabeth Anne Designs. This is a work of love by these two lovely ladies who wanted a comprehensive source to plan a wedding no matter where you live. The library has a search function as well as allow for vendor reviews by the people who matter – our clients! Exciting times! Thank you for the support! 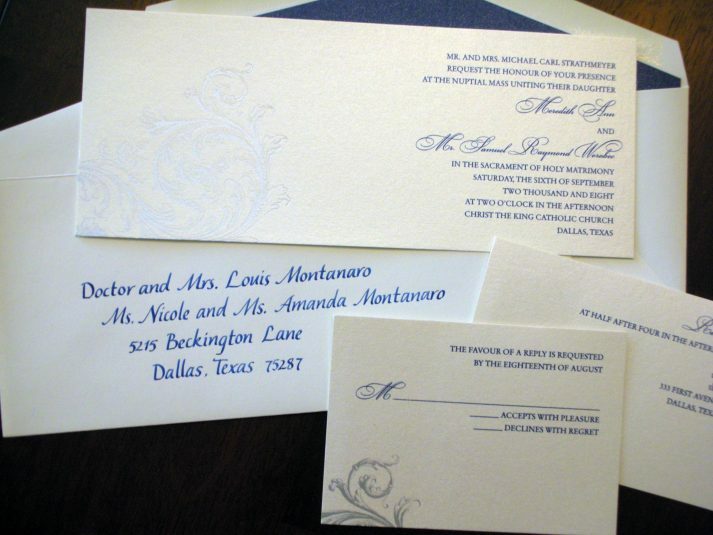 Yesterday I delivered envelopes for a McKinney wedding. The couple liked the clean look of the italic and I was more than thrilled to change up my usual script for the beautiful brown italic. (to be honest, I wanted to keep them and stare at them for a few more days!) I will work on getting a picture of the whole invitation set so you can see where the inspiration came from. Had trouble with the computer this week… enjoy all week’s posts at once! Last week I finished up envelopes for a client getting married with a very casual SoCal destination wedding and wanted a bit more casual calligraphy to accompany it. The final choice fell to the Dexter script with a black ball point pen.